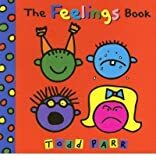 The Feelings Book is for Ages 4-8. The Feelings Book was written by Todd Parr. The Feelings Book was published by Megan Tingley Books. Subjects of The Feelings Book include Children's 4-8 - Boardbooks, Juvenile Fiction / Social Issues / Emotions & Feelings, Juvenile Fiction / Social Situations / Emotions & Feelings, and Social Issues - Emotions & Feelings. About Todd Parr (Author) : Todd Parr is a published author and an illustrator of children's books. Some of the published credits of Todd Parr include Underwear Do's and Don'ts.